Have you ever been to South America, the Caribbean, or West Africa? If you have, you likely saw these banana-esque fruits. Go to any tropical climate and you’ll find the banana’s distant cousin, the plantain. Plantains are a versatile, adaptable, and delicious ingredient. You can use sweet plantains as a fruit or a vegetable depending on the recipe. And, they’re super easy to cook with. If you’re looking for some plantain inspiration, keep reading. Here are 3 mouth-watering recipes that include plantains. In North America, we have loaded baked potatoes. In South America, it’s plantain canoes. Based on the same concept, plantains replace the potato in the former version. Simply deep fry the plantain and stuff with your favorite toppers. Most people will stuff them with ground beef, shredded cheese, and green onion. Bake in the oven and serve with sour cream, salt, and pepper on the side. You could also do a variation of the original by using shredded chicken or shrimp. Or, make it a dessert by using sweet plantains and topping them with fruit or dulce de leche ice cream. 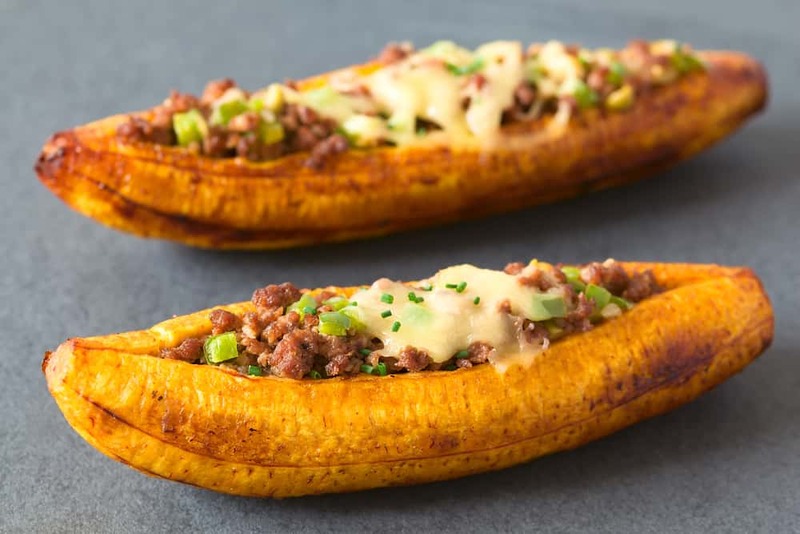 Plantain canoes can be an appetizer, entree, side, or dessert. They’re a testament to how versatile plantains truly are. Sweet plantains are perfect for desserts and dishes that mix sweet with savory. Plantain fritters are one of those dishes that could get served as any course. Start with two ripe sweet plantains and cut them into bite-sized pieces. Deep fry them in vegetable oil on the stove. Prepare the batter as they fry. Mix the batter together, cover, and set aside. Take two fried plantain pieces and put a piece of mozzarella cheese between them. Cover the sandwiches with the batter and place them into the fryer. Dip the final product in jam, caramel sauce, or eat them on their own. There’s nothing like melted cheese between two hot plantains! What dessert is more universal than cheesecake? The South American twist on this global dish uses sweet plantains as a base. The bowl should also have 0.5 tsp of baking powder, cinnamon, and salt. Bake for 50 minutes in an oven at 350 degrees. Top the final product with berries, ice cream, or Nutella. It’s guaranteed to be a hit with kids and adults alike. Ready to Make Sweet Plantains Part of Your Diet? There’s no fruit or vegetable as versatile or adaptable as sweet plantains. It’s included in thousands of recipes and part of hundreds of different global cultures. You don’t have to travel to Colombia, Argentina, or Brazil to sample plantains. Find them at your local grocery store or specialty Latin food store. Switch up your boring go-to recipes by swapping in sweet plantains. One of the most popular plantain dishes is tostones. Learn more about this interesting dish and the best toppings to put on it.